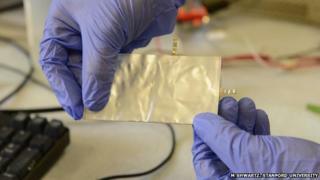 Scientists have built a flexible aluminium battery which they say could be a cheap, fast-charging and safe alternative to current designs. The protoype consists of a soft pouch, containing aluminium for one electrode and a graphite foam for the other - all surrounded by a special liquid salt. It can recharge in less than a minute and is very safe and durable compared to lithium-ion batteries, but currently only delivers about half the voltage. The work appears in the journal Nature. The researchers say it has advantages over lithium-ion batteries, common in electronic devices like smartphones, as well as traditional alkaline batteries. Other scientists have said the work is exciting but still at a very early stage. "We have developed a rechargeable aluminium battery that may replace existing storage devices, such as alkaline batteries, which are bad for the environment, and lithium-ion batteries, which occasionally burst into flames," said senior author Prof Hongjie Dai from Stanford University in California. "Our new battery won't catch fire, even if you drill through it." In fact, a video made by the research team shows that the battery even continues to work for a short period after being punished in this way. We may not expect batteries to withstand such treatment routinely - but this demonstration certainly sets the new design apart from lithium-ion batteries, which have faced safety concerns including recent bans on air transport. Because it is lightweight and inexpensive, aluminium has attracted interest from battery engineers for many years, but it has never yielded a viable product. Key to the new discovery was the choice of material for the other, positive electrode (the cathode) to go with aluminium for the negative electrode (or anode). Graphite - a form of carbon in which the atoms form thin, flat sheets - turned out to deliver very good performance, while also being similarly lightweight, cheap and widely available. To connect the two electrodes, the pouch is filled with liquid. "The electrolyte is basically a salt that's liquid at room temperature, so it's very safe," said PhD student Ming Gong, another of the study's authors. This contrasts with the flammable electrolytes used in lithium-ion batteries. The battery performed particularly well when the team made the graphite cathode into a foam: a sponge-like pattern of tiny whiskers of the stuff, surrounding many empty pockets. This allows ions in the electrolyte solution very easy access to the graphite, helping the battery to work faster. When the battery discharges, aluminium dissolves at the anode, while aluminium-containing ions slide into the spaces between atomic graphite layers at the cathode. When it charges again, the reverse occurs, depositing metallic aluminium metal back on the anode. Crucially, this can take place through more than 7,500 complete cycles without the battery losing any capacity - several times more than most lithium-ion batteries, and hundreds of times better than any previous experimental designs that used aluminium. Similarly, the device's two-volt output is the best seen from an aluminium battery. It is also better than common 1.5-volt alkaline batteries, but lags behind the output of the lithium-ion batteries we use in smartphones and laptops. "Our battery produces about half the voltage of a typical lithium battery," Prof Dai said. "But improving the cathode material could eventually increase the voltage and energy density." Nonetheless, his team has high hopes for their design. Already, just by strapping two of the pouch batteries together and plugging them into an adaptor, they managed to charge up a smartphone in a minute. They also suggest it could be very useful in flexible displays, one of the proposals for the next generation of electronics. Prof Dai clearly believes its voltage is the battery's single main limitation: "Our battery has everything else you'd dream that a battery should have: inexpensive electrodes, good safety, high-speed charging, flexibility and long cycle life. "I see this as a new battery in its early days. It's quite exciting." Clare Grey, a materials chemist at the University of Cambridge, said the work was "definitely a step-change" for aluminium batteries. "Aluminium batteries are very difficult technology and I think their method of storing the charges inside the graphite is rather clever," Prof Grey told BBC News. But she added that turning the prototype into a larger commercial product would be challenging. One problem is that the process of squeezing ions in between the graphite sheets can cause the material to expand and contract, which is "bad news for the battery", Prof Grey explained. "And then also, the bigger the graphite sheets are, the further the ions have got to diffuse in - so the slower it gets. So part of reason it's got this high rate is that it's got very small platelets of graphite." She was impressed by the concept and the demonstration of the new design, however. "I think it's very exciting and it gives new pointers as to how one might get that type of chemistry to work," Prof Grey said.